I awoke with great trepidation this morning - was today going to be the day that the tourist finally dished out the pain. I have been waiting all week and thankfully the threat of pain and suffering hasn't materialized. In addition, I have yet to have a good final stage of the Epic. 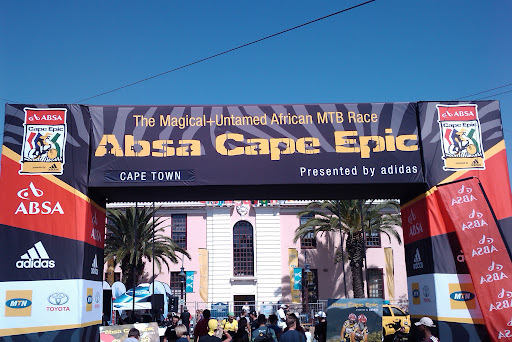 The tourist (also affectionately known to the support crew as the whining pom) put in a great effort today and dug very deep into his suitcase of suffering to finish the last stage of the 2010 Cape Epic in style. Well done Russ. 238th for the stage and 261st overall. I suspect Russell was sabotaged in the night with his real legs being replaced by tree stumps. Thinking about it now, there were other signs that something was amiss. His repeated swearing at Dr. Evil had grown quiet and he wasn't even making his guttural throat clearing sound. Maybe it was aliens or body snatchers. That pain in his bum could well been from a rectal probe. My investigationRr continues. I shall bribe it with cheap wine and see how it responds. This was a stage that promised to be quite a tough one on paper, but dare I say it - Dr Evil has a heart and was uncharacteristically kind to us. Russell had a god day - he is getting stronger with every day and soon will have me in pain. And he rides single track like a demon. We finished well in the top half of the field, beating the coach, the rugby player and the soccer player, but losing out to the pretty boy by 2 places. 207 on GC. Captain's log, Star date 63696.4. The little one showed great heart today in overcoming the obstacles before him. Our mission was to conserve energy and observe the opposition from afar, never to engage. However, due to unforseen circumstances, we entered hostile territory and were forced to defend The Federation's honor. We suffered minor casualties, but the victory was ours. We placed 247th, and gained promotion to the D group. Team manager and spokesperson Yolanda had this to say: "It was a solid performance today. They got a lot of go forward early on. They were solid on defense, attacked well and did well in the loose. They conceded a bit towards the end, but I'm very happy with their performance." The hills are alive with the sound of music - well, to be more accurate, the sound of Russell swearing and clearing his throat. Hills and sand are two of his favorite things. We had as long tough day, and several times Russell threatened to quit. But somehow he pushed through the pain and suffering, and we got our best placing yet - 291st. What a great stage. 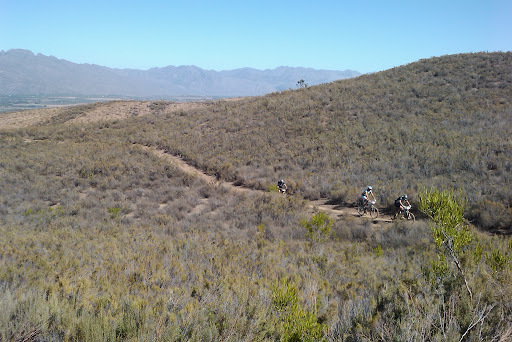 We ride single track till we were sick of it. And then a little but more. It was tough. It was hot. But it was fun. With a bit of moaning, swearing, grimacing, writhing and cursing. And that was just Russell's massage. The nerves are on code red, man the battle stations, one minute to midnight, or whatever other analogy you might prefer. This is it, we have registered, sussed out the opposition (and they seem to get better each year), had the race briefing, got the goodies, packed the bags, ridden the bikes one last time, had the final supper with the family, and quietly died a thousand deaths. No turning back now. Watch out - Team Burger Kings (Team # 74) is ready to deal with whatever Dr Evil can throw at us. After a crazy week of work, training and studying, I am heading off to Australia for some work stuff. In other news, Mike had to unfortunately withdraw from Team Burger Kings. But the team lives on in name (and hopefully dedication to bankrupt the Epic by all the burgers we are going to eat). Russell, the sun burnt englishman, will be Mike's replacement. We should be in for a great time!